This recipe is easy, inexpensive, and our whole family loves it! 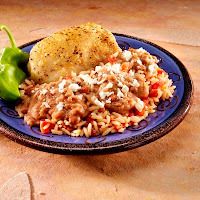 I use a greater proportion of rice and beans to chicken than the original recipe calls for. My recipe below feeds our family dinner, with leftover rice and beans. But if you're serving more people (or your kids eat more than mine) go to this link for the original recipe that calls for 2½ pounds of chicken. Also, I substitute diced tomatoes for Rotel, since my kids are pretty sensitive to spicy foods. Season chicken with garlic salt and pepper. Coat a large skillet with cooking spray. Place chicken, skin side down, in skillet and brown over medium-high heat for 7 minutes on each side, or until golden brown. Remove chicken from skillet. Remove all but 2 tablespoons of drippings from skillet. Add rice and brown over medium heat for about 2 minutes stirring constantly. Add tomatoes and broth; blend well. Place chicken on top of rice. Bring to a boil. Reduce heat, cover and simmer for 20 minutes, or until the rice is tender and chicken is no longer pink. Remove chicken from skillet and keep warm. Drop beans by tablespoonfuls into the rice; sprinkle cheese onto rice and beans. Heat for 5 minutes, or until beans are hot and cheese has melted. Serve with chicken. Pour the lemonade concentrate into a large pitcher. Stir in enough water to make 1 gallon. 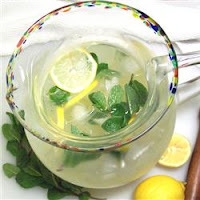 Grate the zest from the lemon and add to the pitcher, then squeeze the lemon juice from the lemon into the pitcher. (Don't worry about keeping the seeds out. You'll be straining it all later.) In a small bowl, crush the mint leaves into the sugar using a muddler or a wooden spoon. Stir into the lemonade. Cover and chill for several hours, then strain to remove the leaves and zest before serving. Serve over ice and garnish with a sprig of mint.